Without being consciously aware of it, my blog seems to have a lot of vegetarian recipes!! I cook a lot of vegetarian dishes, because, as mentioned before, MY vegetarian is my boss, and yes, I call her MY vegetarian. As a chef, it’s almost a preprogrammed notion to “hate” vegetarians, or anyone that needs to alter our menus, but I’ve come to love cooking and experimenting with vegetarian food. We demand so much when it comes to our food, and everyday the demand seems to get bigger. Free range, organic, farm fresh, healthy, local, cheap and good for the planet! Gone are the days of overindulgence, we hardly use cream or cheese, and processed products are a thing of the past. We are trying to be a bit more aware of what we put into our system, and maintain a low carbon footprint. The importance of starting at the home base is also something that I continuously preach to people. Cook, cook and cook. Yes, I know, time, life, work, gym….but just take the time to cook. 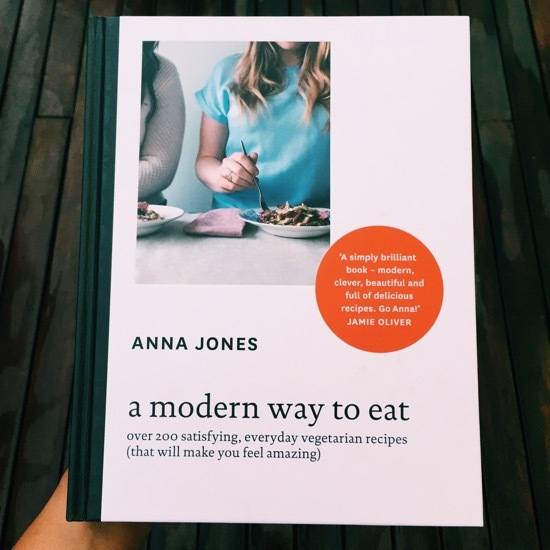 Her cookbook “A modern way to eat” has over 200 recipes – all based on vegetarianism. It’s a modern day take on all things amazing. She incorporates fresh, seasonal produce, into SUPER quick and inexpensive recipes. She’s worked for Jamie Oliver and has extensive experience as a chef, she now works as a stylist and food writer for newspapers, magazines, chefs, and a host of food companies. Her book, breaks it down and takes your back to the “root” of everything, it’s cleverly laid out and reads beautifully, with loads of tips and special hacks, and list upon list of varieties of her favorites. In South Africa, we might not have all the ingredients that are readily available in London, but a lot of what she uses can be found in good health stores and also at fruit and vegetable suppliers. It is really an amazing book, not just for vegetarians, but for any one trying to maintain a healthier and more balanced lifestyle. Also, it gives you loads of ideas for sides and interesting alternatives to what you might already be serving! 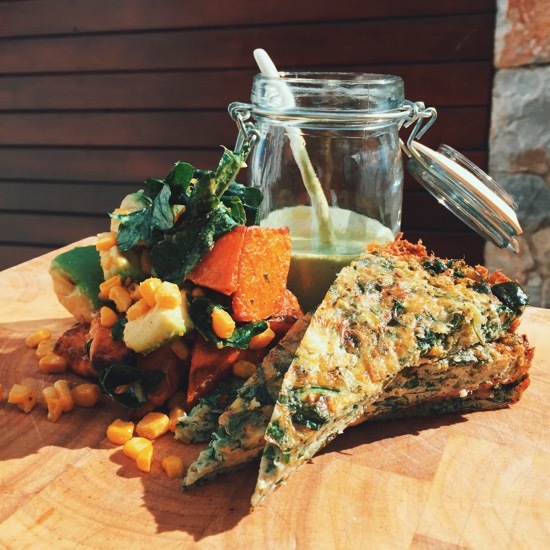 Pictured : Full of green fritters (made as a frittata), Charred corn, scrunched kale and sweet potato salad with a cashew, coriander and lime dressing.